Planet Salem: the international Salem Al Fakir fansite! 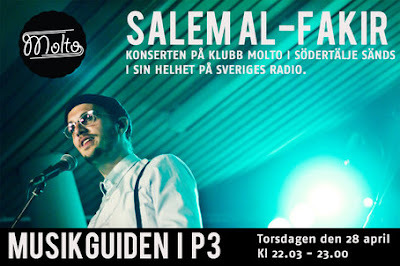 : Thursday 28th April: Salem's Klubb Molto gig on P3! Thursday 28th April: Salem's Klubb Molto gig on P3! 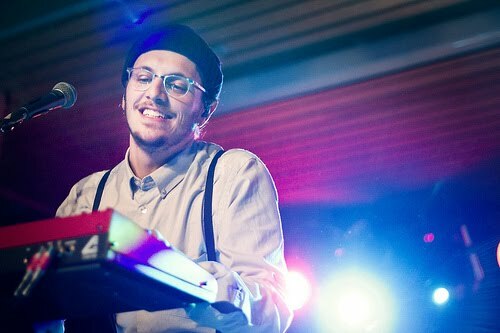 (picture courtesy of Calle Jansson for http://moltolive.nu/) If you remember this post from December 2010: http://planetsalem.blogspot.com/2010/12/klubb-molto-gig-this-saturday.html - well we finally have news about when that Klubb Molto show from Södertälje is going to be broadcast! Make a note in your diaries for Thursday 28th April from 22:00-23:00 Swedish time (21:00-22:00 here in the UK) when you can hear the full hour-long show on Swedish Radio P3's Musikguiden. I'm sure it will bring back many fond memories of Salem and the band's autumn/winter club tour and give those of us who weren't there a chance to enjoy all the hits and more. In other news, don't forget that you can still watch "Kusin Al Fakir" at SVT Play until 24th April. http://svtplay.se/v/2367731/k_special/kusin_al_fakir It really is a fascinating documentary and even if I couldn't really understand most of what was being said, I still managed to get the "feel" of the film and the intensity of Peter's belief and passion in his music. I hope that he doesn't give up on his dream and that he "keeps on rocking on the freeway with a wheel of rock".